As mentioned, your thread has been merged with this one found using the Forum's handy 'Search' feature. You may want to check out post 155 as well. There were many other pictures but when you use a 3rd party posting site the pics aren't saved to our servers and tend to disappear. Good luck. He has a DIY video on his website. All you need is a flathead screwdriver to depress the clip then it just pops out. so this kit allows you to just use a screwdriver to remove the clear plastic & gain access to the bulb.........not cutting, caulking or anything? Where is this video? i cant seem to find it. Click on the link in the quote of post 444 and then scroll down to the "Installation Videos"
PDExplorer asked if anyone was using Sylvania (Osram) "ZEVO" Series LED replacement lamps. I just completed (well, it's almost complete) the LED conversion on my '15 X using nothing but Sylvania parts. I thought I would share my results here in hope that it would make somebody's life easier in the future. 1) Sylvania is a name brand and a global innovator in lighting products. 2) They are readily available from reputable retailers. 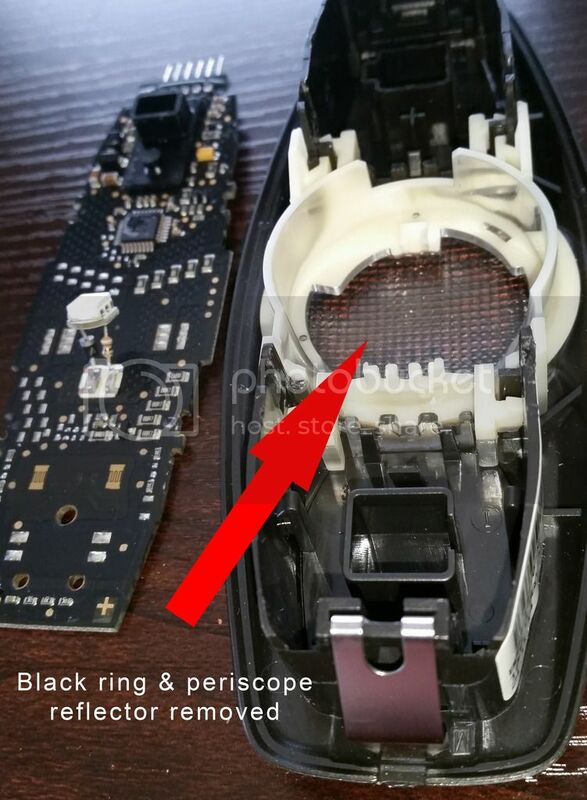 3) As PDExplorer points out, I figure a billion-dollar company has a bit better quality control than something I could find on eBay that is shipped from China. 1) There is a store about 3 minutes from my house. 2) They have stock "on the shelf" and I can SEE what I am buying before I buy it. 3) If I get it home and it doesn't work or won't fit, I can easily just take it back and get a refund. When you add in the numerous bad experiences with "gray market" parts and the frustration of expired eBay and Amazon links making finding good parts even more troublesome, it was a no-brainer. Are they as bright as some of the gray market LED's? Probably not, but they seem brighter than the stock bulbs - at least in the interior - and my goal was not to blind myself (and others), but just convert them to the "sexier" LED versions. And my hope is they won't give me any problems in the long run. Keep in mind that, like the gray market lamps, these are NOT D.O.T. approved. Phillips claims to have some versions of their LED replacement line that have received D.O.T. approval, but I didn't look in to that. The entire conversion cost about $190 with tax... plus some elbow grease and head scratching. Installation for the front map lights was simple and straightforward. Probably the easiest to replace. For this installation, I left the domed plastic "diffuser" on the front of the bulbs to soften the distribution of light. In my opinion, they are adquately bright. Installation for the 2nd row courtesy lights was a little trickier. 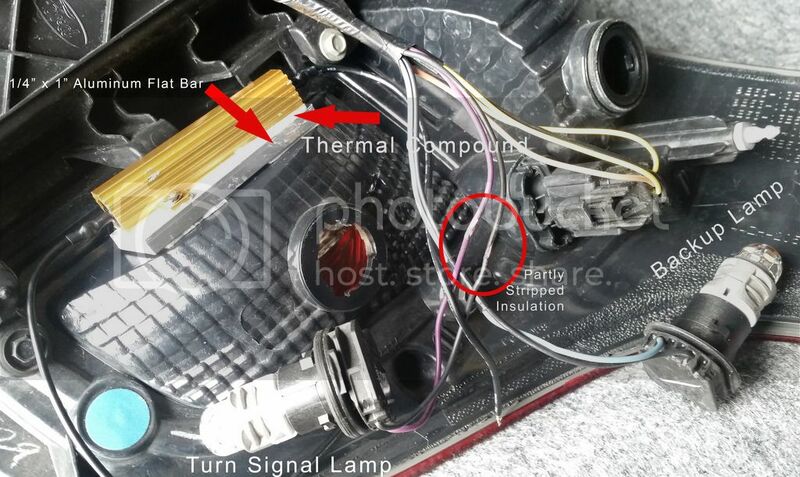 The bulbs install from the side of the housing and there is no reflector. The 168/194 LED bulbs from Sylvania only use 1 LED and it is focused out the end of the base through a domed "diffuser" cap. So the only light that exits the housing is what emits from the side of the diffuser. That's not a very efficient use of the light. Fortunately, the bulbs can be easily modified to "fire sideways", through the lens and down toward the seat. Using a tiny flat-blade screwdriver you can pop the diffuser cap off the base. Fold the wire leads back straight. This gives you enough slack to "tweak" the LED to point toward the side of the base. Since polarity matters with these bulbs, you may need to fiddle with this a little in order to maximize the light coming through the lens housing. And just leave the diffuser cap off, you don't need it. 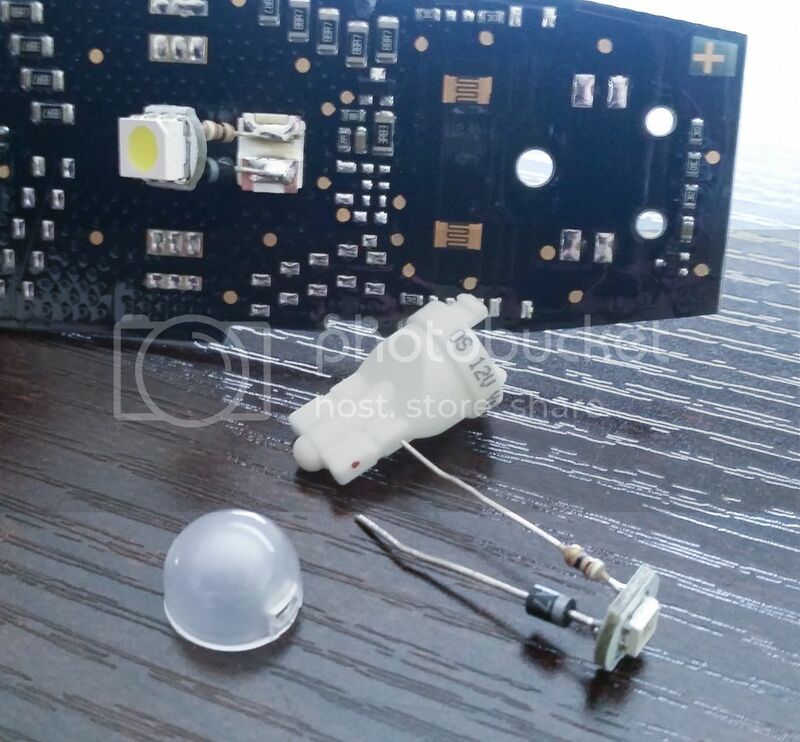 The lens of the housing is sufficient to diffuse the light from the LED. I did NOT install the 1/8 watt 1k ohm resistors as others have suggested. Everything seems to work fine, however when you turn the individual lights on/off with the lens switch, the other lights will quickly flicker for a split second. Adding the resistors might eliminate that, but it's a minor annoyance so I'm not too concerned about it. Nothing to report here. It was a simple swap, and very easy. Works great. 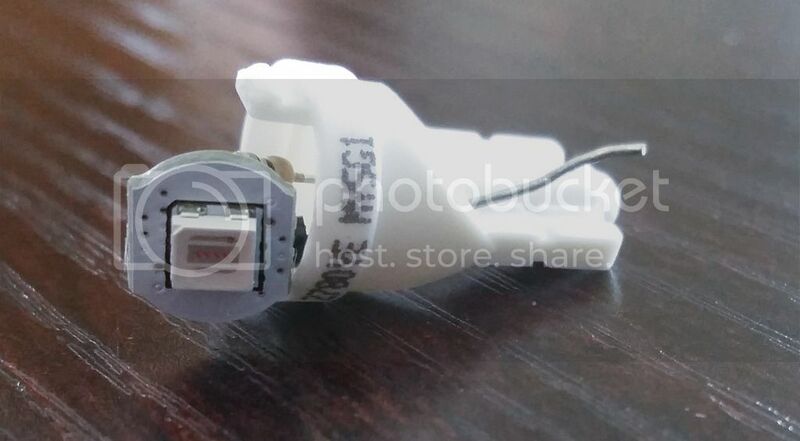 This is a "festoon" bulb. This was the first ZEVO series light I installed. Appears brighter than stock. Again, this was a simple swap, and it works beautifully. This one was also fairly straighforward, but I did do one modification. Like the 2nd row courtesy housings, these housings to not have reflectors, and the bulbs install from the side. In this case, I removed the diffusion cap from both lamps before installation. But with or without them, the illumination on the plate was pretty uneven and not very bright. Here's where the modification comes in. I just happened to have some "Faux Stainless" style Con-Tact brand self-adhesive shelf liner left over from another project. Rather than risking a short circuit with aluminum foil, I decided to try this first. It is somewhat rigid like construction paper, so it holds its shape with a little coaxing. I cut about a 3" long, 1/2" wide strip and slid it through the hole where the bulb socket twists in. I used forceps and Q-tips to get it to curve the way I wanted it (note, I did NOT remove the backing, the paper just sits loosely). I trimmed the excess so it wouldn't stick out the hole. The result was a curved reflector that redirects the light more evenly. It offered much more efficient use of the light, and gave a more even cast to the license plate. And it won't cause a short because the paper is non-conductive. Works great! This one is a bit trickier. 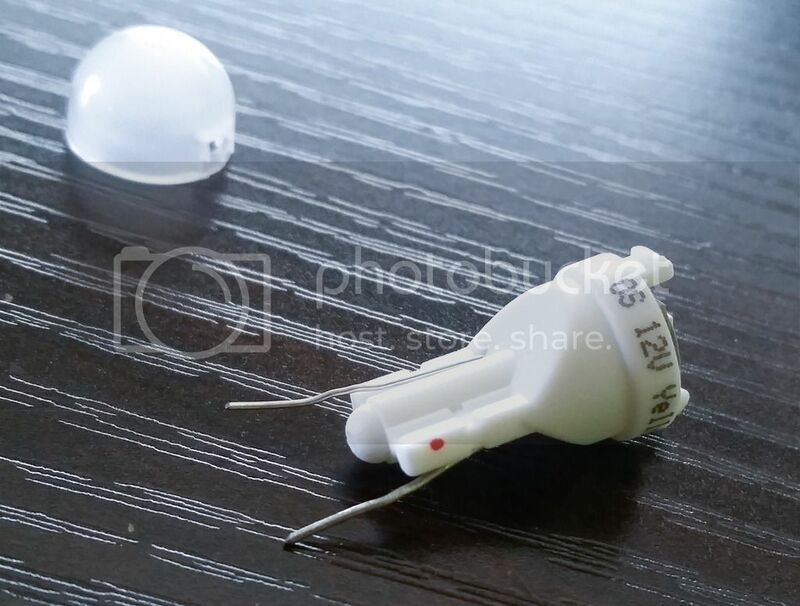 If you've done your research, you know these are a sealed housing and the bulb cannot be replaced (technically). 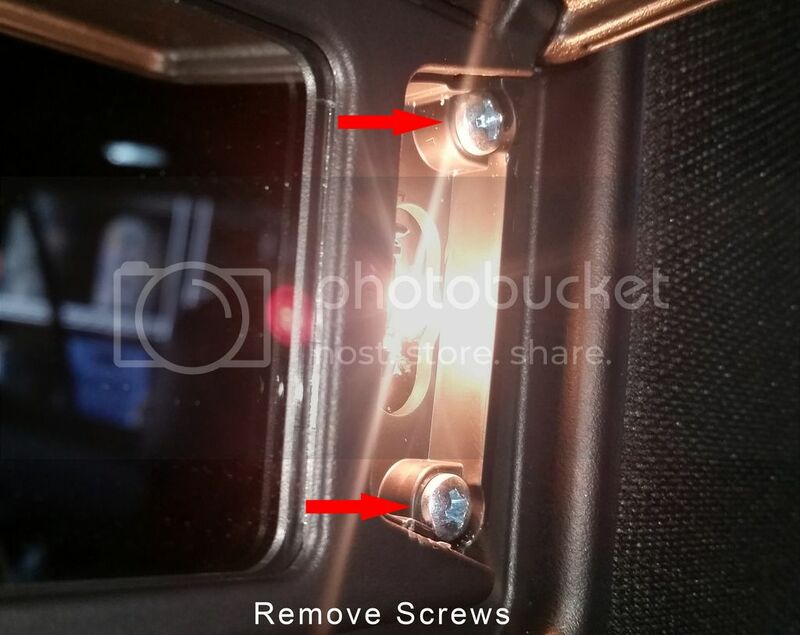 To separate the lens from the housing, I used an X-acto knife heated with a heat gun (you'll want to use gloves). I used the heat gun to get the X-acto blade good and hot, then worked it along around the edge of the puddle lamp lens, reheating frequently. It worked, but the edge was still a little rough. I was hoping I could get a nice clean edge, but alas. Though it did remove less plastic than a Dremel cutoff wheel would have. Once the housing is open, bulb replacement is easy. 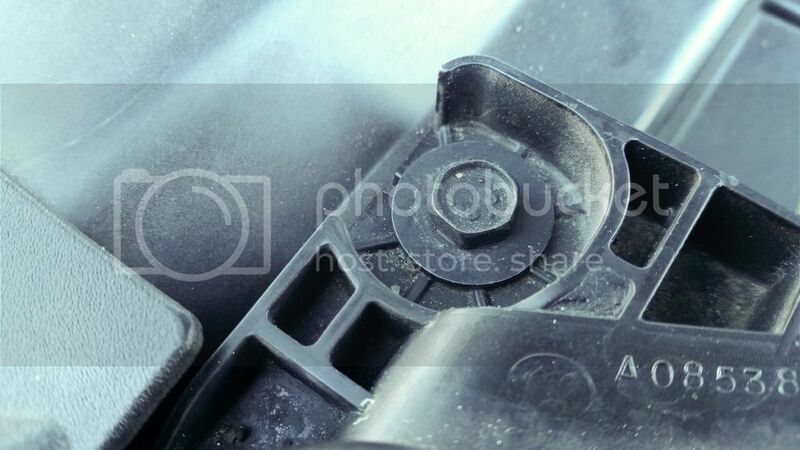 Then, I sanded down some of the roughest edges so there wasn't any plastic bits sticking out here and there. Finally, I used a very light bead of clear silicone adhesive to carefully "glue" the housings back together. It seems to have worked, but only time will tell how moisture proof they are. These were easy. I popped the diffuser caps off the 194 bulbs as they didn't seem necessary, but other than that, no modifications were required. Direct replacement. Once you get the housing off the vehicle, replacement is easy. It's a direct swap, and this is one instance where I think the LED's truly are brighter. I seem to be able to see better with the backup camera at night. It was a good upgrade. The turn signal bulbs take a little engineering. First off, I took off the hood overslam bumper towers by removing the two 8mm bolts. The front turn signal sockets can be a bear to remove. 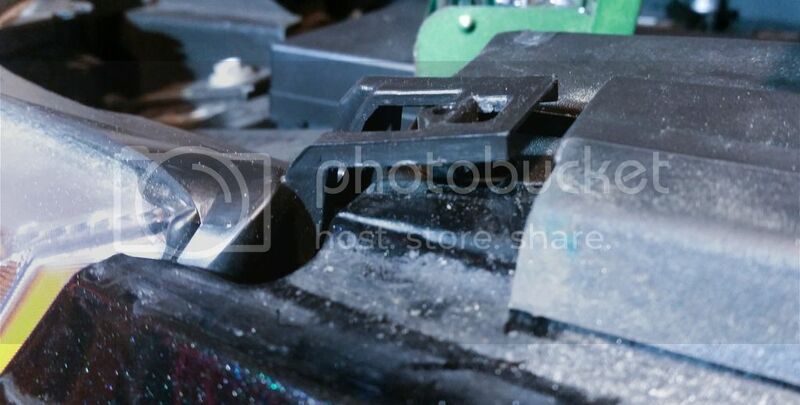 To help, I removed the 10mm bolt toward the front of the housing, and then, using a flat blade screwdriver, I popped up the rear "tab" that holds the back in the sheet metal. 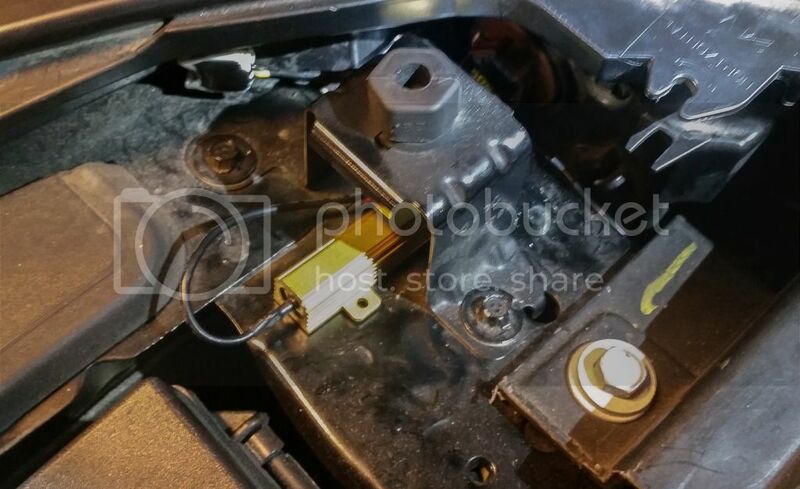 This doesn't let the housing move much, but it gives you an extra fraction of an inch that seems to make it a little easier to get the bulb sockets in and out. Once I had the sockets out, I started by just replacing the front and rear bulbs with LED's, and then testing the turn signal function. The hazard flashers work fine, but the turn signals hyperflashed. Damn. Okay, I guess I need ballast resistors. So, I bought a pair (2), thinking that all I needed was one for the left, and one for the right. I patched in one of the resistors to the rear circuit. The turn signal still hyperflashed. To make a long story a little shorter, I won't go in to the details of my troubleshooting. But you will need ONE RESISTOR PER BULB - in other words TWO FOR THE FRONT, and TWO FOR THE REAR. 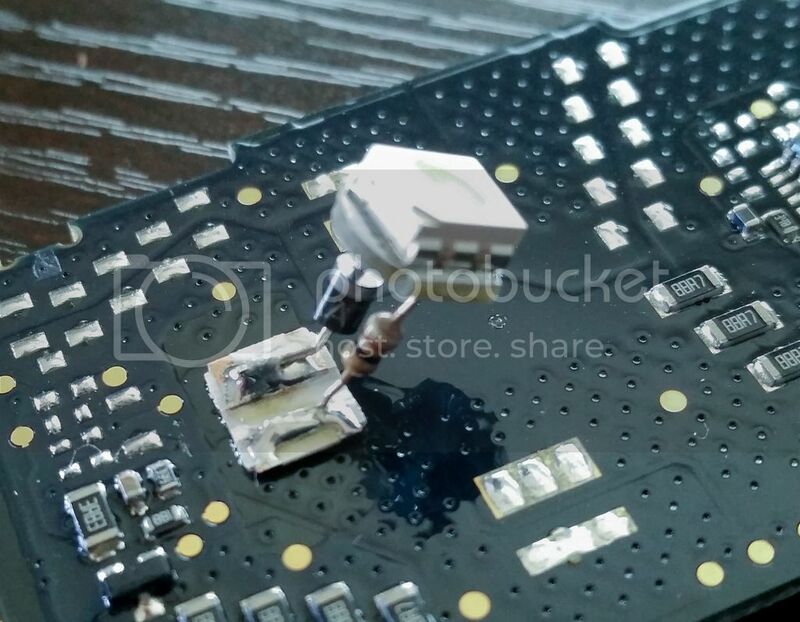 Once my tests proved that I was able to get the LED's to flash without hyperflashing, then I started working out how to install the resistors permanently. On the rear, I decided to use Harley#356's method with the aluminum flat bar. (You'll note that the Sylvania resistors are quite a bit bigger than his were.) 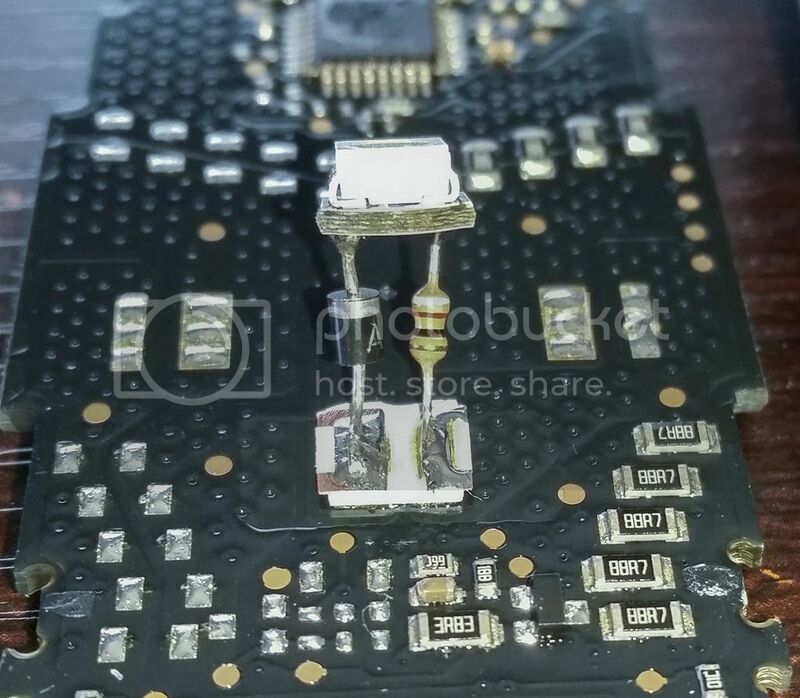 But rather than using gel super glue (which is an insulator) to attach the resistors to the aluminum, I used screws and added heat sink thermal compound (just happened to have some) in between the resistor and aluminum to increase heat dissipation. I then attached the whole thing to the light housing with 3M VHB double sided tape. It's not going anywhere. For the front, I decided to mount the resistors - rather conspicuously - right under the hood overslam towers. This actually is a pretty ideal location. 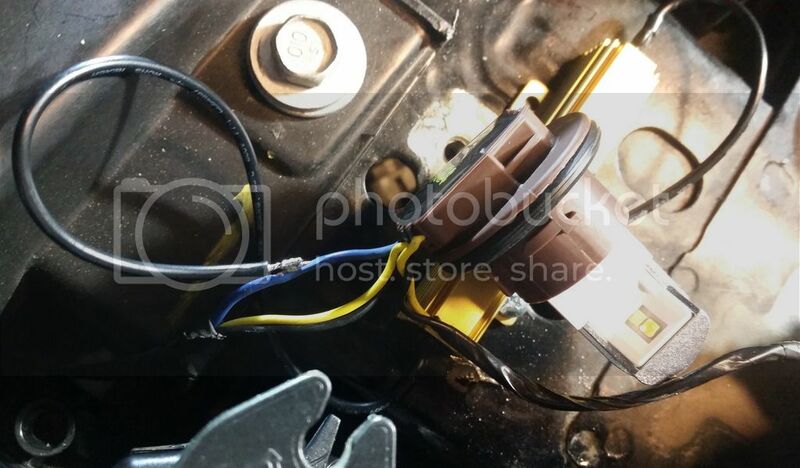 It's easy to access, you can mount the resistors right to the sheet metal for better cooling, obtain a solid ground with a crimp ring lug, it's directly adjacent to the wiring harness, and the resistors can get plenty of air around them. Wiring in the resistors in is a little tedious, but not complicated. You can use the "Scotchlok" style pinch taps if you don't know how to solder, but personally I hate using them. They are too bulky and look unprofessional. Not to mention you can potentially cut the wire in half if you are not careful. Therefore, I prefer soldering. I used an X-acto knife to carefully strip part of the insulation from the appropriate wires. I then soldered the resistor wires to the factory wiring conductors. Once the resistors were soldered in, I double checked that everything was working, and then used electrical tape to cover the solder joints. Finally, I re-installed everything as it was. I used 6000K "white" LED's for the front because the stock bulbs were clear. However, the "whiter" light from the LED's washes out the factory orange color that you see with halogen bulbs. The color is a little more yellow than before. But it looks okay to me. For the rear, I decided to go with red versus amber, but Sylvania does make an amber 7440 LED, in case you want to stick with that. 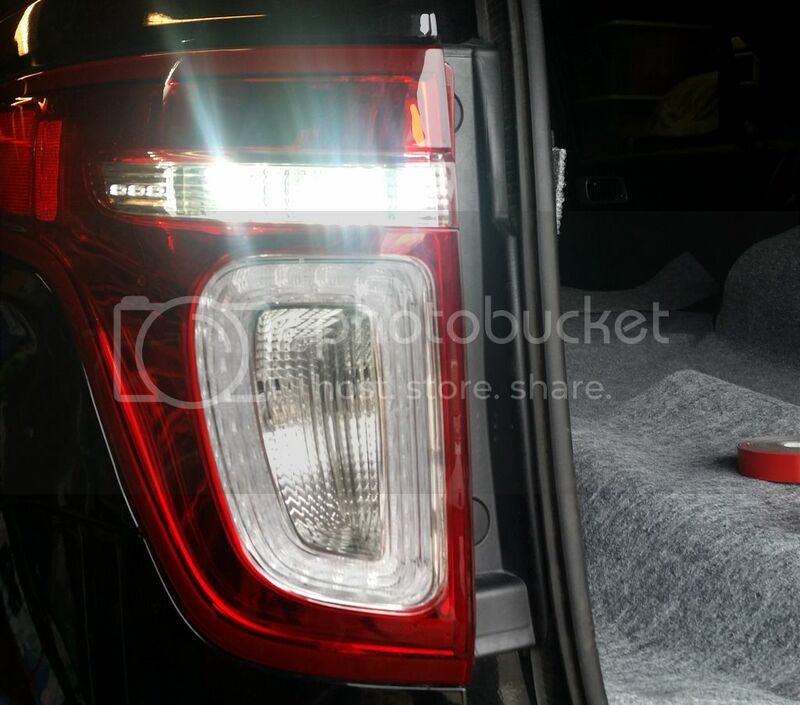 The LED's don't seem to "fill" the reflector with light like the stock 7440 amber halogens. I'm not saying that the LED's are "dimmer", per se, but you certainly don't get the VOLUME of light in the reflector that you do from the stock bulbs, if that makes sense. The resistors DO get hot. Surprisingly hot even though they are only flashing at about a 50% duty cycle. After the turn signals are on for several minutes I couldn't touch them for more than a second. That probably means the surface temperature was somewhere around 130F degrees. However, I don't think they are getting hot enough to do any significant damage to plastic parts or wiring. I think they would need to get quite a bit north of 200F degrees to soften plastic parts or melt wiring insulation. 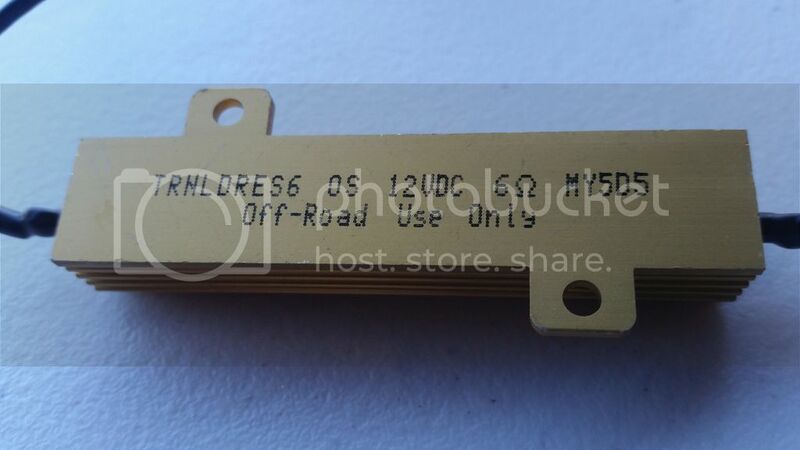 The ballast resistors are housed inside finned aluminum heat sinks. A heat sink works by increasing surface area available to the air to facilitate better cooling. The manufacturer's instructions recommended installing them against metal to improve heat dissipation. 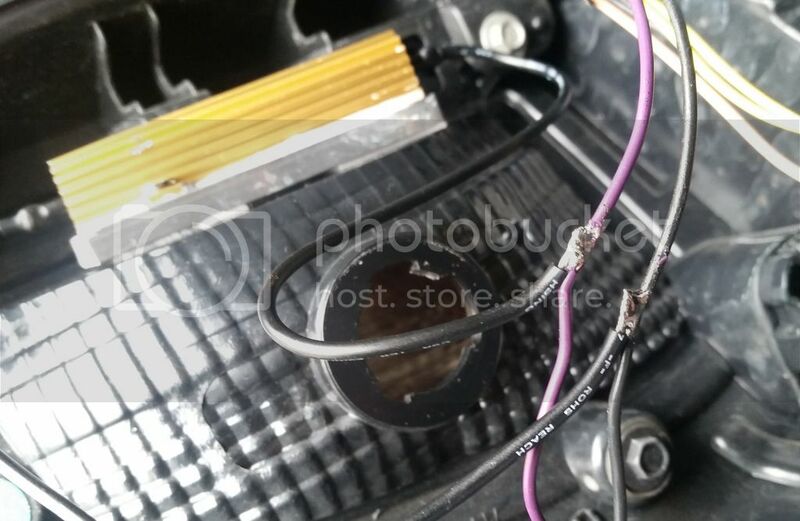 On user mentioned wrapping electrical tape around the ballast resistors in order to keep them from melting something they touch. DO NOT wrap the resistors. That will actually make the resistor even hotter because it can't get the airflow it needs to disspate heat. So install the resistors in as much "free air" as you can. I want to figure out how to disable the interior lights altogether. I've seen a number of users on the forums ask how to disable the interior lighting when the doors open. I, too, find it annoying that there isn't a simple way to do this. I've enjoyed the ability to disable the interior lights on the last two vehicles I have owned. A better solution for the center console compartment. 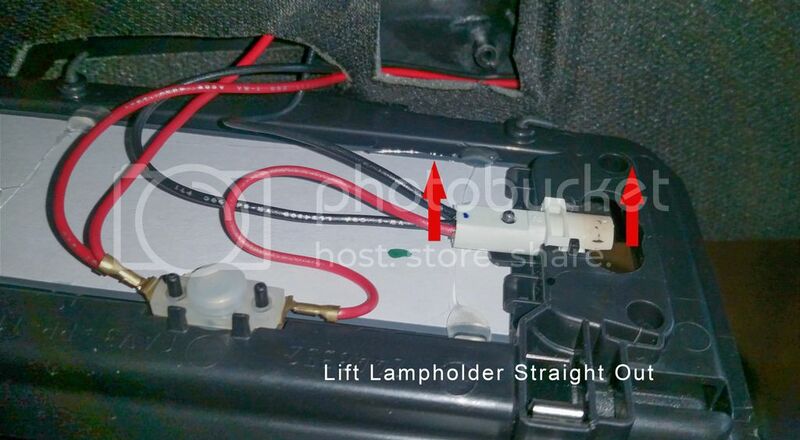 I currently have a battery powered "taplight" mounted in the console compartment so that I can find items at night. Why Ford didn't put a light in there like they did the glove compartment I will never know, especially since the driver is far more likely to use the center console for storage. And since the map lights aren't positioned over the console, they are no help with illuminating the inside of the dark compartment. I have contemplated a couple of solutions - either tapping the power from 2nd row 12V power point in the back of the console, or the backlight for the rear climate controls (but those only come on with the park lights). Visor Vanity Mirror LED's. I haven't converted my visor mirror lights to LED yet. 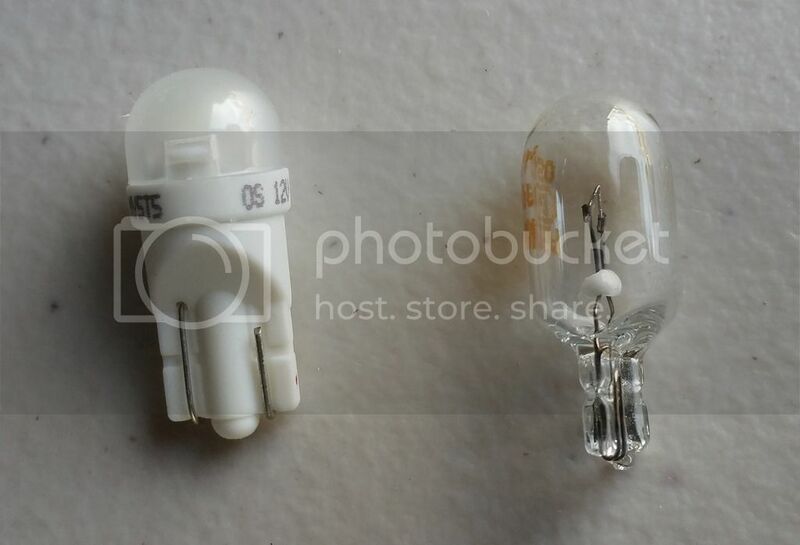 Sylvania doesn't seem to make the very small T5 wedge 74 LED replacement bulbs yet. I may have to resort to gray market. But here's how to get to the bulbs. H11 Fog/Driving Lights. I haven't decided yet if I will convert these to LED. Since a poorly focused bulb could blind - or at the very least annoy - oncoming drivers, I want to be sure that my choice here does not create a bigger problem than it solves. Headlights. I likely will not convert these if for no other reason than I don't want to have to figure out how to retrofit an LED solution. 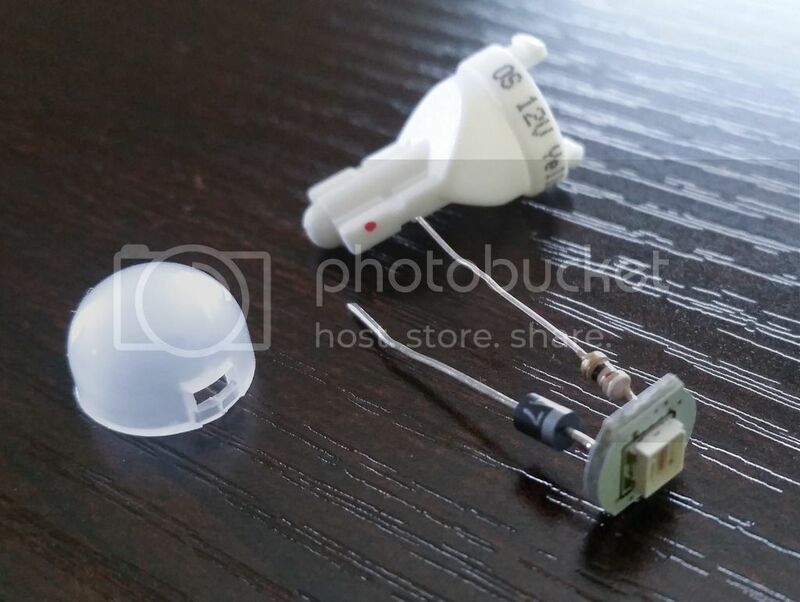 From my current research, it appears that there is no direct swap that will fit in the HB3 lamp socket without causing headaches. If someone here knows otherwise, correct me. Exterior Lighting ALWAYS ON. 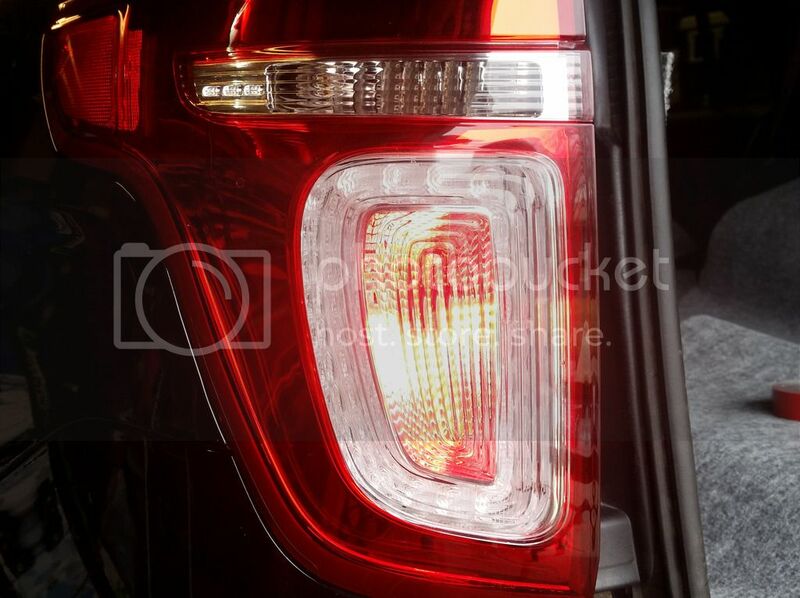 I would like to figure out a way to have the tail/marker lights and headlights come on ANY TIME the car is on - not just at night. I drive with my park lights and headlights on during the day - to me it's just safer. I also ride motorcycles, so maybe it's the "always be visible" philosophy that riders live by. I think that's it. If you have questions, let me know. Happy to help if I can. Thank you for putting this together. I went the Sylvania route, as you listed, with a couple of differences, in that I have already put LED headlights and foglights in. I found it odd that I only needed one resistor on the right to eliminate hyper flash, and on the left, with only one, it would not hyper flash unless the headlights were on. I haven't finished yet, because I've decided to go get amber LEDs for the front turn signals, instead of the clear ones I bought. I'm going to do the front resistors at the same time. I did the Drive Bright puddle lamps as well. I'm glad I did, because the OEM lamp on the driver's side literally fell apart when I was trying to take it out. Hi all, this is my first post, I would like to appreciate all the information provided. I found everything I need here. 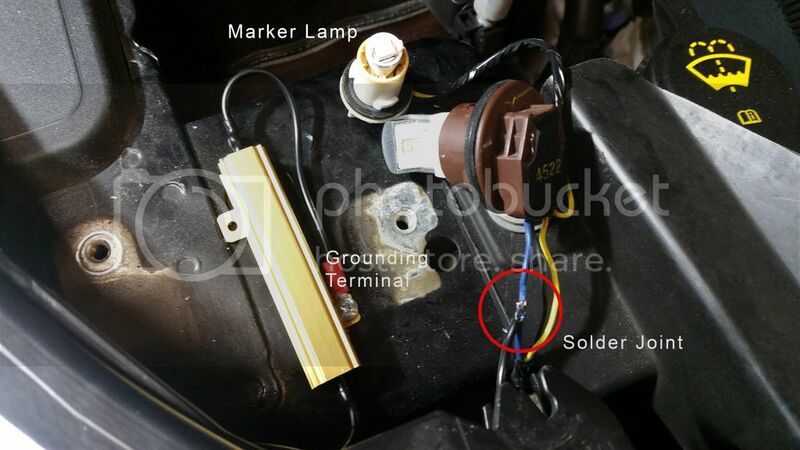 I have a 2016 Explorer Limited and of course I swapped all my lights except for the "one button 3rd row dome light" which I am planning to get from www.drivebright.com, as I am not a good solder! Lots of good info in the Forum on several topics. Please add the trim level (Limited) to your profile as requested when registering. That way it will show up in the margin when you post. Thanks. forget DIY puddle led lights. I must of changed out at lest three times. I went with this a few months ago and no regret. $29 bucks is a hell of a price. Where do you think Dan is getting his parts from? Still, it's someone here to contact, should they fail. He could be buying those very ones and selling them to us in fancy boxes, for all I know. What matters to me, in certain cases, like this, is that I have someone to reach out to for warranty. The last time I bought something Chinese that failed, and I attempted to contact the company for warranty replacement, I was completely SOL, as they had zero presence anywhere for customer support. For some things, it's worth it, at least for me. I just ordered LED puddle lamp assemblies from Drivebright dot com. Informative website and some members of this site have purchased Drivebright products. The price included two license plate LED bulbs and I like that I don't have to disassemble the old puddle assemblies, insert an LED, then reseal the assembly. Me too. I used all Sylvania LEDs for the small bulbs. I tried the Drive bright ones in the license plate, but found the Sylvanias did a better job of lighting the tag. There are plenty of other places they can be used though.